The Bognor huddle at Enfield - now the squad have been hit by more injuries / Picture by Little James Photography. Bognor have told the Sussex FA they cannot play tomorrow's Sussex Senior Cup semi-final. A growing injury crisis at Nyewood Lane has worsened today and it is thought they do not enough even for a starting XI. Absences leave them with a maximum of nine players to select from - and those include a couple of Pompey loanees who could yet be recalled. The county FA and Brighton have both agreed it can be played on a new date - Tuesday, April 9. But they have lost home advantage as the FA HQ at Lancing is available that night. Tomorrow's game had been due to be played at Bognor. It is down to an "unprecedented" catalogue of injuries for the Rocks. 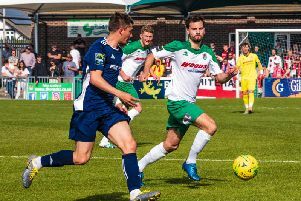 Jack Pearce's depleted squad dwindled further after the 3-3 Bostik premier division draw at Enfield Town with defender Keaton Wood, striker Jimmy Wild and winger Mason Walsh all picking up knocks. Keeper Dan Lincoln is already sidelined - along with Jimmy Muitt, Calvin Davies, Doug Tuck and Gary Charman while Harvey Whyte is away and Ed Sanders, Joe Tomlinson and Joe Bennett are all cup-tied. And Leon Maloney has been recalled by Pompey for an U23 game. That would leave, available to play Tueaday night: Harvey Read, Chad Field, Tommy Scutt, Richard Gilot, Theo Widdrington, Joshj McCormick, Brad Lethbridge, Petar Durin and Ollie Humphries. Pearce explained: "It's unprecedented situation. We are extremely thankful to both Brighton and the Sussex County FA for their understanding and help in overcoming the current difficulties. "We simply can't put out a team but we are grateful to Brighton for agreeing to the postponement and to the Sussex FA for showing common-sense in allowing the game to be rescheduled." The rescheduled fixture will take place at Culver Road, Lancing on April 9 with a 7.15pm kick-off. The next worry for the Rocks is seeing how many they have available for Saturday's home league game at home to Leatherhead.